On November 1st, marking 100 days since the Egyptian Parliament’s adoption of Law 161 of 2018 on the treatment of senior military commanders, the Cairo Institute for Human Rights Studies (CIHRS) issued a FAQ guide explaining the law and its political implications. The law is intended to bury crimes committed under military rule in 2011 and after June 30, 2013 while acting as an authoritarian pact between the president and his high-ranking officers: it ensures immunity for the military personnel implicated in serious crimes while acting as a check on any military ambitions for presidential power. Indeed, Egypt’s military is incriminated in many of the most egregious crimes committed in the nation’s history, including virginity tests on female protestors in Tahrir Square, the running over of demonstrators at Maspero, the beating and killing of protestors at the Cabinet clashes and on Mohamed Mahmoud Street, and the massacre of nearly 1,000 people in a matter of hours in the violent dispersals of the sit-ins at Rabaa al-Adawiya and al-Nahda squares, in what resulted in one of the worst civilian massacres in modern history. Military commanders designated by presidential decree under Law 161 are granted immunity against prosecution for all the abovementioned crimes: Egypt’s Public Prosecution and Military Prosecution are prohibited from taking any legal action against designated military commanders, except with the approval of the Supreme Council of the Armed Forces. SCAF reserves the right to reject any request for summonses or questioning. 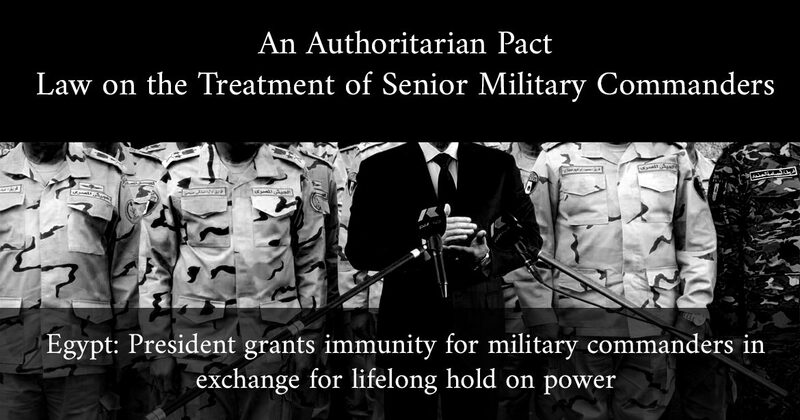 In what appears to be a deal or pact implicit in the law: in exchange for legal immunity, diplomatic privileges, official honors, and favorable salaries and pensions, the president is able to strip all military commanders he designates—at his sole discretion absent any standards—of their right to run for office, vote, and exercise all political rights after the completion of their military service. The law considers military officers designated by the president to be in active, life-long military service; thus ensuring that President Sisi, who ratified the law, need not worry about senior commanders setting their sights on the presidency as General Sami Anan did in the earlier this year. In this way, the law acts as a guarantor of President Sisi’s authoritarian rule, setting the stage for him to remain president for life. Law 161 ensures Egypt’s national courts will deny justice to victims of military crimes, thus leaving the international justice system as the sole means for bringing accountability to military commanders culpable for violations—whether by ordering them or carrying them out—that have cost hundreds of lives over the past seven years. With Egyptian law shielding criminals from accountability, it is only international law and international courts with the potential to ensure that the crimes of the Egyptian military will not be buried along with the victims.